On July 27, Scott Dozier was granted his wish—Clark County District Judge Jennifer Togliatti ordered him executed. 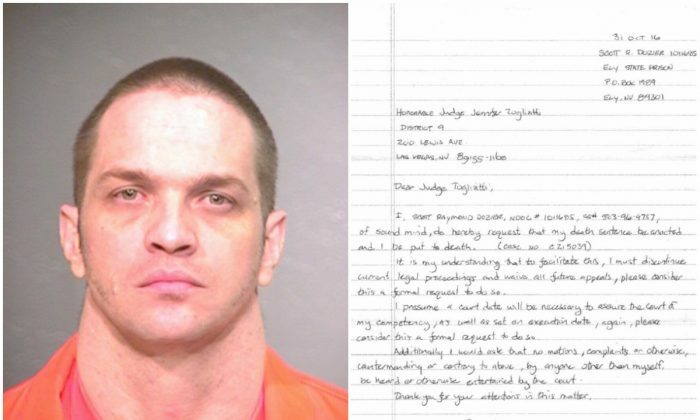 The two-time murderer gave up on his case and asked to be put to death in an Oct. 31 handwritten letter to his attorneys and the judge. The state of Nevada, however, doesn’t have the means to execute him as its supply of one of the chemicals used in the deadly injections has expired. Statewide, no company seems willing to sell the state a new batch. Dozier hopes the drug issue will be resolved—though he would prefer a firing squad. Dozier, 46, hails from Boulder City, Nevada, according to his Facebook page. Little seems known about his early life. What is apparent from his court papers though, is that Dozier was a methamphetamine dealer. Sometime in 2001, Dozier was under the impression a man named Jasen “Giffen” Green, 26, threatened to expose his meth operation. Dozier shot him in the back of the head with a rifle, chopped up his body and buried it in the Arizona desert. In April 2002, Dozier was broke. He convinced an associate, Jeremiah Miller, 22, to come to Las Vegas, promising to help Miller buy ephedrine, a drug used in the production of meth. Miller came with $12,000 in cash. But the deal never went down. While staying at La Concha, a motel on the Strip, Dozier killed Miller (possibly shot him). He then sawed the body to pieces, stuffed most of it into a suitcase, and threw it into a dumpster by an apartment complex in western Vegas. Dozier then went on a shopping spree with Miller’s money. The body was found by a maintenance worker on April 25, 2002. Miller’s hands and feet were never found. Dozier was arrested on June 25, 2002, after a short car chase with police in Phoenix. “Sorry, but I have to do this,” he told his girlfriend Emily Tsou, who was with him in the car, together with her loaded Smith & Wesson semi-automatic. In 2005, Dozier was sentenced to 22 years for killing Green. In October 2007, Dozier was sentenced to death for killing and robbing Miller. Unaware of his jarring disregard for life, one could be easily deceived by Dozier’s capabilities. He’s articulate, humorous, even artistically imbued, and keeps himself well groomed and physically in shape. His pursuit of death seems to be motivated by a boring prison life. “I’ve got a surplus of time on my hands and a catastrophic dearth of intelligence, hilarity, and awesomeness,” he wrote in a letter to a vice editor in 2013. Hi execution has been set on the week of Oct. 16, the Las Vegas Review-Journal reported. “It’s been a long time, your honor. I’m ready to go,” he told the judge during the July 27 hearing.